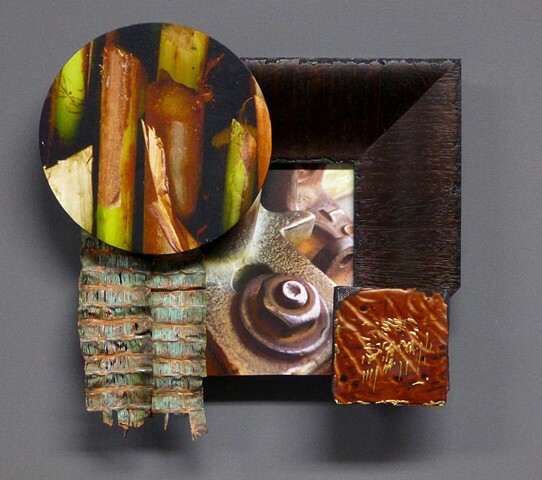 A photo of a brass and steel assembly taken outside at glass artist Steve Adams' studio was laminated to wood then partially framed in a piece Lorna St. John gave when Don Hamilton was cleaning old framing samples out of the studio. I mounted a photo taken in Peru on a disk and added couple of lengths of radiator tape to give an award-medal look. The little canvas in the corner is a transferred and painted image of worm-eaten would in New Mexico.